For those who are interested primarily in chickens (and there seem to be an awful lot of you), I'll continue to post the occasional chicken update here, but I'll probably post more chicken-related things on our cute-pet-photos blog, Too Many Animals. There are also some nice dog and cat photos there. Fish and Fish do not care to be photographed, so I rarely mention them. Anyway, another gorgeous day. 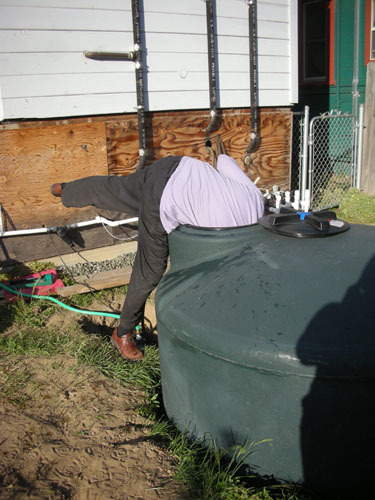 We had a few cooler, more overcast days earlier this week, but today it was nice and sunny and just the sort of day that made you want to pitch head-first into a water tank. Actually, that's Noel getting some water out of the tank to refill the fish tank for Fish and Fish. I had been running the system to use up water, so the level was very low. I think we're going to make a simple hose circuit to handle situations like this. Also, we're still adjusting to how much water we have. The lawn is getting watered almost every day. We're still working out the kinks of how to water evenly over time to spread it around more judiciously. And on occasion, we still turn the street sump back on and dump a bunch of water in the storm drains. On this fine day, the dianthuses started opening up. 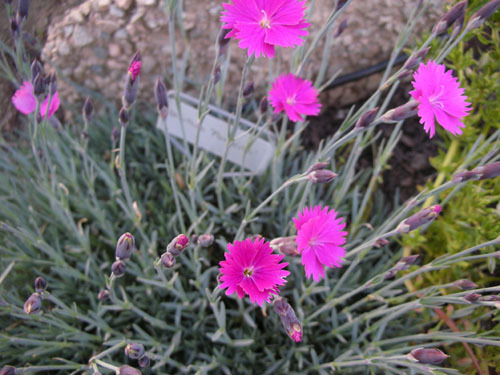 Here's Dianthus deltoides 'Flashing Lights,' which I got from Annie's Annuals two years ago. It's still amazing when it blooms. On the less-subtle side, we have the neon 'Firewitch,' always ready to put on a show. This is also the time for the late-spring bulbs to open up. What the heck is this? It looks like a Fritillaria, but I don't know which one, and the tag is gone. Well, it's pretty, anyway. 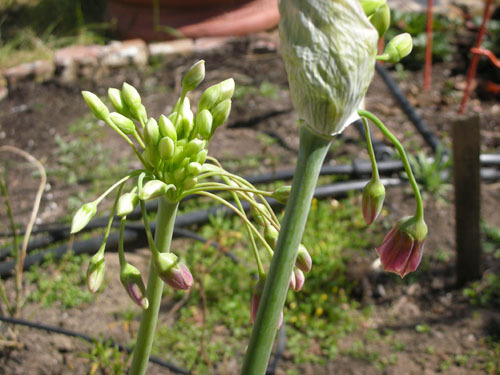 Also starting to get interesting are the alliums, including Allium schubertii. I don't remember these taking as long to bloom last year, but then again, I was a trifle busy. 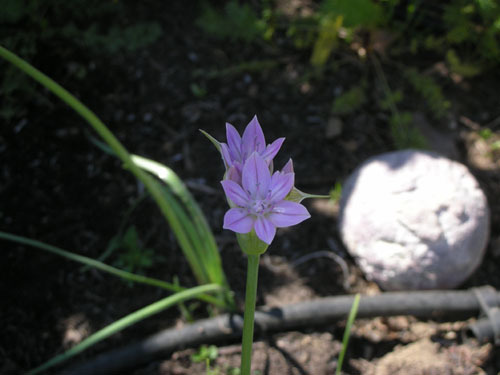 And another allium, over by the quince. 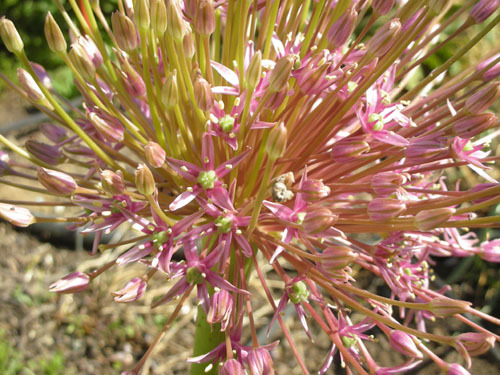 I bought a handful of of different allium varieties, and now they are all mixed up and all over the place, but it mostly doesn't matter that much. 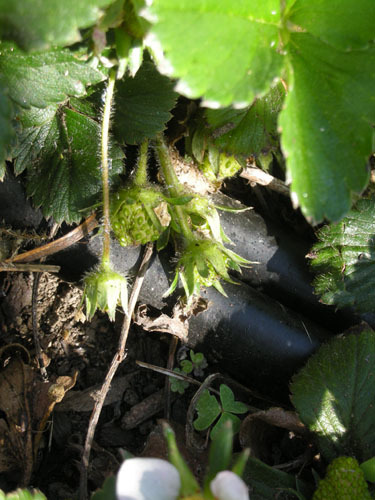 Another nice discovery today: the first strawberries setting up on the plants. Now I just need to keep snails, dogs, and birds out of there for a few weeks. Anyway, the strawberries have recently crossed the line into "somewhat invasive" by making a foray towards the shed. I pulled them back, but I would say that if you want a decent groundcover and you have regular water, go for strawberries. Hey, the Globularia trichosantha is starting to bloom, too. I never remember that plant's name without looking at the tag. 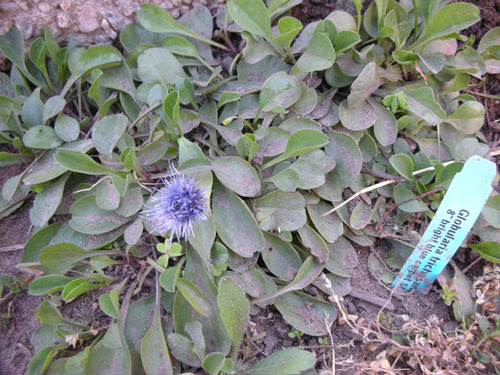 Nice, subtle purple flowers, though, and it is doing a good job of spreading out to be a little groundcover-y. 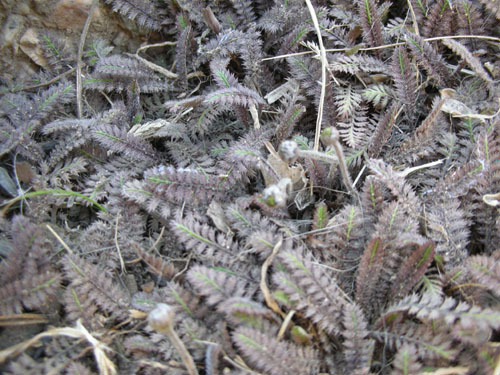 Last year I planted Cotula leptinella in the bottom of the rain water basin as a ground cover. It's doing very well and getting ready to bloom. 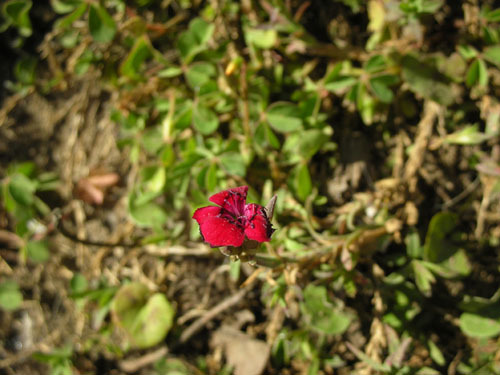 It has tiny, yellowy flowers that are just a side show to the foliage. And finally, tonight I went through and removed seed plugs that had not germinated, and re-sowed seeds that I really wanted. Lots of tedious, but there you have it. 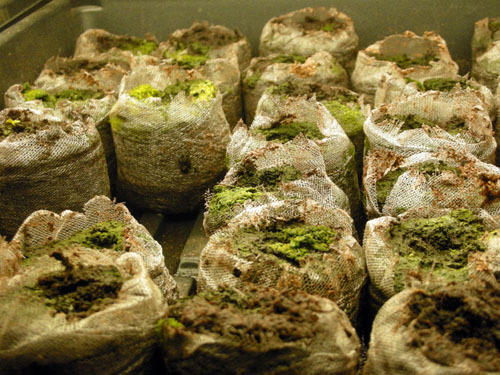 Not everything germinates promptly, and your options are to re-sow or to over-sow.